Common information to help you prepare for your home inspection. Recent media attention has focused on granite countertops and whether they can increase your indoor radon levels. While testing your home for radon is always a good idea, a few clarifications are in order. FACT – All natural products, especially stone, minerals, and sand, contain trace amounts of some radioactive elements called NORMs (Naturally Occurring Radioactive Mineral) that can produce measurable amounts of radiation and sometimes radon gas. 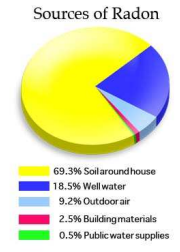 This includes all concrete products, clay bricks, most non-plastic plates and dishes, coal and the fly ash produced in coal-fired power plants, natural gas (contains radon), phosphate fertilizers used in your garden (all contain potassium and small amounts of uranium and thorium), and the vegetables grown using those fertilizers. The U.S. Border Patrol often catches truck loads of marijuana because it is loaded with radiation producing potassium. All glass made using silica (even eye glasses, wine glasses, mirrors, windows, etc.) contain trace readings of radon and granite too. There are thousands of items we could list. However, the key word is “measurable”. As an illustration, compare the radon produced by your naturally occurring stone surfaces, such as granite, to the heat produced by a birthday candle. Although you wouldn’t be able to heat your entire kitchen using a birthday candle you can easily feel the heat if you put your hand over it. This is similar to placing a Geiger counter over a tiny speck of uranium, thorium, radium, or potassium. The detector will make thousands of clicks per minute but be of little concern. If your stone surface emits a small amount of radon, as happens in most cases, it will generally be insignificant when diluted with the quantity of air in your entire home. You are hundreds of times more likely to be at risk for radon emanating from the soil beneath your home than from your granite counter top. Our Home Inspection professionals are ready to help you. Choose your inspector on the next page and choose an available time slot from their calendar to schedule your appointment online.